UDM Downloads > Flash2X EXE Packager! Flash2X EXE Packager is a program to covert flash to EXE files. 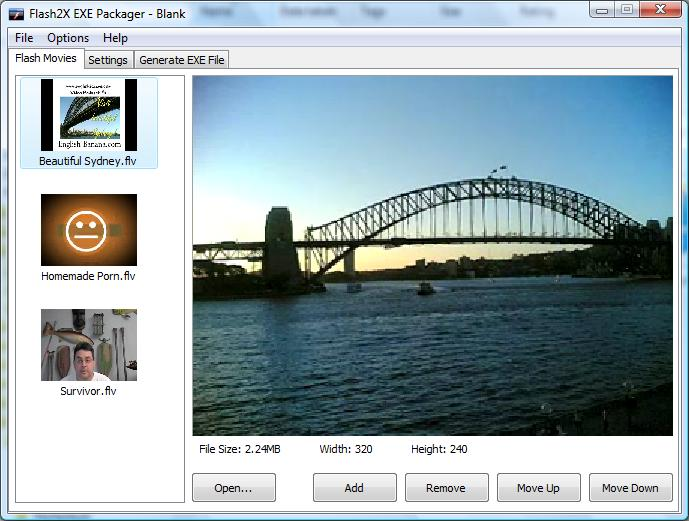 It supports both flash (SWF) and flash video (FLV) formats. You can customize your flash executable files to playback your flash and flash videos in the best way, and protect them from being used. Flash2X EXE Packager allows you to create executable files with a trail period and unlock code, so you can sell your files as shareware software. It is a great piece of software to help you sell your flash games without further programming work. Key Features: * Covert a batch of flash (SWF) and flash videos (FLV) into one single EXE file; * Support creating executable files in shareware mode; * Customize built-in flash player interface; * Protect your flash and flash videos from being saved to local drivers; * Save and restore executable file settings with projects.